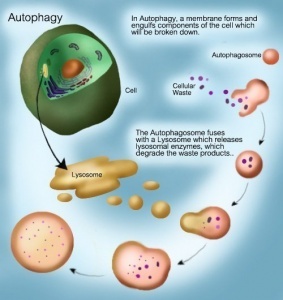 What is autophagy? The word derives from the Greek auto (self) and phagein (to eat). So the word literally means to eat oneself. Essentially, this is the body’s mechanism of getting rid of all the broken down, old cell machinery (organelles, proteins and cell membranes) when there’s no longer enough energy to sustain it. It is a regulated, orderly process to degrade and recycle cellular components. Nutrient deprivation is the key activator of autophagy. Remember that glucagon is kind of the opposite hormone to insulin. It’s like the game we played as kids – ‘opposite day’. If insulin goes up, glucagon goes down. If insulin goes down, glucagon goes up. As we eat insulin goes up and glucagon goes down. When we don’t eat (fast) insulin goes down and glucagon goes up. This increase in glucagon stimulates the process of autophagy. In fact, fasting (raises glucagon) provides the greatest known boost to autophagy. You need to get rid of the old stuff before you can put in new stuff. Think about renovating your kitchen. If you have old, crappy 1970s style lime green cabinets sitting around, you need to junk them before putting in some new ones. So the process of destruction (removal) is just as important as the process of creation. If you simply tried to put in new cabinets without taking out the old ones, it would be pretty fugly. So fasting may actually reverse the entire aging process by getting rid of old cellular junk and replacing it with new parts. Autophagy is a highly regulated process. If it runs amok, out of control, this would be detrimental, so it must be carefully controlled. In mammalian cells, total depletion of amino acids is a strong signal for autophagy, but the role of individual amino acids is more variable. However, the plasma amino acid levels vary only a little. Amino acid signals and growth factor/ insulin signals are thought to converge on the mTOR pathway – sometimes called the master regulator of nutrient signalling. How long do you need to fast to get this result? Brad Pillion’s Eat Stop Eat goes into this a little more. He suggests that autophagy peaks in the 16 to 24 hour range of a water only fast. Hence his recommended 24 hour fast, once or twice a week. Will coffee (without sugar, milk, cream or butter) cause the autophagy to stop? Any pointers on this? Black coffee helps stop my hunger pangs and hence I do have 2-3 cups of black coffee while fasting for 24 hours. I just finished my first 24 hour fast and feel amazing! Had 3 cups of black coffee and two cups of tea in addition to plenty of water entire day yesterday. You don’t have to worry about coffee or tea, but beverages with artificial sweeteners do mess up the hormonal balance. Can u add cream to coffee? If it doesn’t spike insulin shouldn’t it be ok? The article states that even a small amount of protein stops autophagy. Cream has protein. Heavy whipping cream has 0.3g of protein per tablespoon and 0.02g of sugar. I would not be splitting hairs that way. Too much anxiety leading to rise in Cortisol and insulin spike. Much worse than what you are concerned about. Yes, just a little bit. Butter is safer, use your blender. Your link doesn’t work. I’m trying to find studies corcerning Caffeine & Autophagy. I don’t see any article about the sugar interfering with autophagy. Surely sugar takes one out of autophagy, its halts ketosis . Looks like some studies even support the hypothesis that caffeine it actually can promote autophagy. I also wanted to know if I had to give up coffee and put “caffeine promotes autophagy” in google. It returned a lot of great info that says it may be beneficial. I don’t know that there is any definitive answers yet but from what I’ve seen, it seems like it’s ok. No cream or sugar of course. You may drink black coffee or even coffee with a bit of cream. Technically, Bulletproof coffee would also be okay. I believe that the IDM clinic has seen great results when patients do 3 fasts a week of 24 hours. I’m not sure if the results mean they have reached autophagy but it has shown results in the areas of overall health, reduced risk of disease and loss of weight. Does he say autophagy stopi with black coffee? I,ve been using intermittent fasting for about 7 years and have noticed amazing results. I am a 51 year old natural bodybuilder and I have watched people in my age group get older at such fast rate and yet I ( or so I have been told ) don’t look older than my early 40’s. I have investigated nutritional practices for the last two decades and this process has been the most profound I yet to come across. Do you eat a specific type of diet along with the IF schedule? Muslims don’t fast. You gorge yourself on all kinds of food at night and don’t eat during the day. That isn’t a fast. Dude, I was wondering is honey suppress autophagy? honey contain zero protein. Does anybody know what prophet SAW eat daily from morning when not fasting? If you eat before sunrise and then after sunset (as during Ramadan then I wonder whether you will get the benefits of autophagy which requires fasting of 16-24 hours. That’s wonderfull, but it’s still not a fast. Looking for the bad in others and then spewing back at them in anger doesn’t seem terribly Christian to me. It’s inappropriate for you to tell someone from a different faith tradition that their mode of fasting is not true fasting. That’s not your place to judge. Why don’t you just concentrate on being more Christ-like instead? Why is telling the truth non-Christlike? We are having a discussion about fasting and the practice that he is referring to does not fit the definition of fasting in the above article, especially for the main benefits talked such as autophagy and growth hormones. Therefore in the interests of avoiding confusion, it should not be referred to as a fast in this discussion. I’m sure it is a wonderfully enlightening experience for him, but it is irrelevant to the topics in the article. My nutritional list told me that quinoa is not a grain. It is a seed. It is high in protein low in carbs. Yes, technically a seed not a grain and higher in protein than most other grains and seeds but still too high in carbs…. I was wondering how long also. I eat 500 calories on my fast days; does that stop autophagy? Also does not eating any calories for 15-16 hours each day give enough time for autophagy? In the above post, Dr. Fung explains that eating even a little stops autophagy. See next-to-last paragraph. If you eat 500 calories on a given day, you are not truly fasting. You are restricting calories. Why not go all the way and try a true 24-hour fast, with only water, tea, or coffee (no sugar)? Believe me, it’s easier than you think, and it gets easier as you get used to it. Dr. Fung’s approach is based on true intermittent fasting. I personally suspect that fasting means what it says: – not DIETING. FASTING = NOT EATING. To me, that means ANY calorie intake whatsoever during a ‘fast’. Otherwise you are turning ‘fast’ into a ‘diet’. It’s seems that is very hard for some people to get one’s head around NOT EATING. Apparently, for centuries, we all have been ‘programmed’ to EAT, EAT, EAT. Fasting, to me is a form of ‘controlled eating’, which translates into a health exercise – NOT starvation or self abnegation. Would eating the fat engage the digestive process though? Hi Valeria, I read someplace that fat can raise a hormone which in turns lowers Growth Hormone which in turn inhibits the ability to avoid muscle loss during fasting. I did read it the study in NCBI so It’s not a joke. I can’t find the article right now but I agree with others here to just go cold turkey from about dinner to dinner the next day. Yes, at the 29:30 mark in the video you provided the link for. It seems he stresses that you can eat fat “in theory” and still maintain autophagy. I have found the easiest way to ‘get over the hump’ on a fasting day is to keep busy! Drink water, tea, or coffee, your favorite (zero calorie) apple cider vinegar cocktail. Water with some salt in it helps me. Brush your teeth-the mint will suppress your appetite. Go for a walk. Read a book. If all else fails, take a nap!. The killer for me is turning the TV on. If I do, I’ll end up eating. This would give you four hours of autophagy per day. 500 calories in a day is quite a bit of food and it is 500 more calories than you would eat on a fast. If you eat any protein, autophagy will stop so eating 500 calories means you will never get there. You only have to miss 1 meal (breakfast) to get a 16 hour fast (assuming you eat dinner and lunch) so you don’t really have to eat that many calories. A fast day means no eating so if you eat 500 calories you are not fasting at all. In fact, that’s a fair amount of calories for people who eat a full meal per day. My understanding is that you have to go a minimum of 18 hours without any calories to even start the process of autophagy but some say it can take a few days (with no calories). Are there any studies on adding MCT oil, coconut oil or exogenous keytones to fasting ? any caloric foodstuff or beverage you put in your mouth breaks the fast. why use oil and other fats to increase ketosis when most folks have more than enough on their own bodyfat for that purpose? Nils, could you post references to studies that show the levels of autophagy in humans 12 or more hours after a fast begins? @Misty – This paper (http://spectrum.diabetesjournals.org/content/17/3/183.full) states “During the first 8–12 hours of fasting, glycogenolysis is the primary mechanism by which glucose is made available…Over longer periods of fasting, glucose, produced by gluconeogenesis, is released from the liver.” This seems to suggest one would need to fast longer than 12 hours to get this effect. Exactly, Dr. Fung has explained this in one of his videos. I looked it up and the most abundant amino acid in bone broth is Glutamic Acid- I wonder if that amino acid does not interfere with autophagy? Bone broths would have a full complement of amino acids, including leucine, in them (though, the cysteine content is rather low). So, it would be inappropriate to consume bone broth during a fast intended to induce autophagy. Kevin, I don’t take any protein while fasting and have gained strength while fasting. In fact, I’ve gained so much strength that I re-injured an old shoulder injury to the point where I had to stop lifting weights. I also had to stop doing leg presses with machines, as I got to the point where I could lift the entire stack for too many reps.
BobM, how do you time your weight workouts relative to the fasting period? You fast how many hours per day? Why do you say Warrior diet is the worst way to fast? It really makes sense to follow circadian rythm regarding to food intake. Also, it makes sense that ancestors hunted or collected food all day and ate at night only. Also, food intake relates to sympathetic and parasympathetic nervous system. I think if you are going to fast for 24h, ie. eat only one meal per day, then you should be eating it at night. I suspect it’s because the insulin response is substantially higher at night than daytime. And stuffing an entire’s day worth of calories into one meal or meals over a four hour period doesn’t seem too healthy from a post-prandial perspective. And it’s also how Sumo wrestlers eat. Yes, but Sumos gorge on anything and everything ~ a specific program designed to gain weight. That’s not the IF way – most (not all) people doing IF are doing keto or paleo type eating plans, not bingeing on huge portions of super caloric food all at once. They (Sumo’s) are also eating rice and drinking saki, which are LOADED with carbs. This is why they gain weight. And they are definitely eating more than once a day…. Used to be they were not allowed one bite of food until mealtime which was at night. I have since seen stories to the contrary but they eat tons of fattening food. Lots of white rice, beer and such. Check this out! Sumos eat this way to increase weight for professional reasons but it doesn’t create visceral fat. They actually rate very well in in all the categories you’d think their enormous size would prevent risks (heart disease, diabetes etc). “Presents risk” – not prevent! I just read last night in ‘The complete guide to fasting’ that you don’t loose muscle until ALL the fat has been used. Fasted resistance training has some interesting effects on HGH production. I read somewhere that is increases it by as much as 2000%, but recommend personal research to confirm. Dr. Fung has at leat one post on this web site where he explains why fasting doesn’t cause loss of muscle mass. Therefore, you don’t need to take supplements for that, especially with a comparatively short 24-hour fast. I’ve been taking L-arginine (amino acid) with the hope that it would lower my BP without meds. Is this supplement detrimental to my fasting? Thank you! Fasting itself will help regulates your BP. In fact, its one of the major effect of IF along with decreased of triglycerides and maintenance of blood sugar to an optimal level. You don’t lose muscle until about 7 days of water only fasting so there is no chance it would occur after 24 hours. Even after 7 days, the amount of muscle is very minimal which is why you have people doing 14 days of water only fasting or longer without major issues (but anything over 7 days should be done under supervision). hmm… talk about fortuitous timing! mercola’s site just published this article about autophagy and other ways to boost autophagy, other than intermittent fasting. Does autophagy happen in the brain too…as in beyond the post-menopausal blood-brain barrier? If so, how does the waste matter get OUT of the brain (through the post-menopausal blood-brain barrier)? Is there any sort of supplement help we can give to speed up the cleanout of our aging brains? The lymphatic system extends into the brain. When I have done extended fasts I felt de-toxing from the brain too 🙂 A good quality rebounder designed to move lymphatic fluids is also good for helping the lymph system move buildup of toxins out of the brain – and the rest of the body too. I have found that my headaches while fasting might be lymph stagnation that starts in the back of my neck. My EVIDENCE: OTC pain relievers don’t knock it BUT if I do gentle neck rotations, shoulder shrugs & shoulder blade squeezes then about 1/2 hr later, I notice the headache has disappeared! (otherwise the headache may last all day) Also helpful are pelvic tilts/thrusts, help move lymph upward. Has anyone else noticed this? Headaches during a fast could also be related to low magnesium levels if you are not taking a suitable supplement (magnesium oxide is worthless). I’ve given magnesium (citrate) to friends/family who complain of multi-day headaches, and most of the time it alleviates it within a half hour of taking it. Is there a certain rebounder that you use to move lymphatic fluids? I use a Bellicon and love mine!! I feel so much better since I have added this to my daily routine. Yes. That’s why it is helpful for people with Altimeters’ Disease. Curious why you are calling it the post-menopausal bbb. I’ve never heard of a difference in bbb after menopause. Can you elaborate? Does fasting and autophagy increase the probability of ADN mutations? I would reason that it lowers the chance as mutations are more frequent in damaged/not perfectly functioning cells. As autophagy gives the body the opportunity to clean out old or damaged cells, the occurrence of those is reduced. Hence this would result in a better relation between healthy and damaged cells and therefore indicate a lesser probability of mutations. Interesting article on doing protein fasting to bring about autophagy. Does adding lemon or lime to your water break the fast? I have been trying to figure this one out, but can’t find any info. Hi Petra…from what I’ve seen, both personally and from others, a squirt or two per glass of water is OK. My ketones stay above 3.0 on extended fasting (after three days) when I take 2-4 squirts of lemon juice in my water throughout the day. Dr. Fungs Long Distance Program guidelines allows for use of lemon in water. I am dabbling with 16:8 intermittent fasting and have done one 24hr fast. I find that coffee keeps hunger pangs at bay. I have added butter to my coffee instead of milk, in case the lactose in milk (added to coffee) induces an insulin response and hence “breaks” the fast? Will a small amount of milk do this? Should I just go with black coffee? Steve, what (machine presumably) do you use to measure ketones? Best keeping high calories like butter,cream and milk out of fasting period and staying with water and squirts of lemon. Reserve the goodies to eating periods for minimum insulin spikes and hunger pangs during following fast, is my take. I use the Precision xtra blood glucose/ ketone meter. The machine is very accurate when I compare it against lab test results. NOTE: the ketone test strips can be VERY expensive when you buy in the States ($3-5/ each). I recommend using sparingly! Glucose strips are much cheaper. I also have a Ketonix breath ketone tester with pretty good results. Take care. Does juicing stop the fast? I juice fruits and veggies to get the nutrients and also drink 2l of water. Am I doing it wrong? I mean, I take the fiber out the fruits and veggies and just keep the water they contain. Juicing is a big no no. The juice is all the sugar. To juice one glass of say apple juice, you probably need at least five apples. Try to eat five apples at one go, can you do it? You actually want the fiber in fruit as it is like antidote to the sugar. Juicing does the opposite! You’re right that many juices are very high in sugar. But some very low carbohydrate vegetable juices, such as celery juice, have almost no sugar. I usually do water fasting, but once in a while I’ll do a two or three day juice fast, drinking thing like celery juice, cucumber juice and a little Himalayan salt, along with water, black coffee, and green tea. I’ve found that these very-low-carb juice fasts work well for me…. not as a substitute for water fasting, but as an occasional alternative. It depends on the nature of your fast, and which juices you’re using. If you’re doing a 5 day “protein resticted fast,” juices are allowed, as long as they contain minimal protein. Parsley juice, celery juice and cucumber juices work well on this type of fast. They are also, incidentally, low in protein. But if you’re simply trying to lose weight by skipping meals, don’t juice during the times when you’re skipping meals…. juice later in the day and have the juice with your meal. There is a specialized juice fasting protocol called The Master Fast System, thought up by Gino DiSerio. His closed FB group has lots of photos and reports of how it is working for people. Anyone wonder why Dr. Fung recommends All Bran to help increase fiber? The 2nd and 3rd ingredients are sugar and HFCS. I don’t get it. Does he recommend the brand ‘All Bran’? or is he recommending to eat (all bran) meaning bran which has not been de-nuded of it’s fibre………..which is a way to get more fiber? I can’t imagine him promoting the sugary cereal by that name. Following a calorimetry test, I was told by my physician that my REE was very low (its 1250, he estimated that it would be over 1600 based on my weight and height). My question: could fasting cause my metabolism or REE to go even lower? I am a 58 year old female, about 50 lbs overweight. I exercise 3-4 days a week (bootcamp) and follow a low carb diet. I didn’t lose any weight until I started fasting 2X a week. Thanks! If you have done low calorie diets in oast it could have slowed you down. Doing the fasting should reset your metabolism as you fix insulin resistance n lose weight. Michele, if you listen to Dr Fung’s videos, one of his main points is that when you cut total calories, the body responds by lowering resting metabolism, thus negating the value of dieting. The whole point of his approach is to use intermittent fasting to lower insulin while NOT lowering total calories more than a few hundred calories below your metabolic need. Does eating a sandwich stop the fast? I’m having trouble understanding why people are having trouble understanding. Fasting means fasting – as in no calories. None. As in zero. Does diet coke stop the fasting process since it has zero carbs/calories? Does the artificial sweetener cause an insulin spike? as a T2D I cannot eat any sort of artificial sweetener without getting a bs spike……..does that answer your question? Question: When you say amino acids stop autophagy, does that mean calories = amino acids? Is there any citation or link to discussion about the idea that autophagy is started when glucagon goes high? Is there any biochemical marker – particularly one that can be ordered today at a commercial lab – that would signal the body is in autophagy? If Dr Fung’s claim that high glucagon is the biochemical trigger for autophagy is true, then it might follow that Metformin will slow or stop autophagy. Just to add to my comment on Metformin: Metformin has been shown in lots of studies to increase autophagy. The method of action for this is to increase AMPK, which then in turn downregulates MTOR. This upregulates autophagy. Since Metformin – independently – appears to downregulate glucagon, then one would assume that autophagy is not upregulated by rising glucagon? Because if autophagy increases when glucagon increases, then you wouldn’t be able to explain how Metformin manages to increase autophagy. Wait- a small amount of amino acid will stop the process, I’ve been fasting three days with lots of lemon in my water- like 3 lemons a day. Lemons contain amino acid? Does this mean I’ve just wiped out all my effort? ok, I looked it up and lemons do not contain amino acid. but they do contain 4 carbs, so the question is the same, would 3 lemons a day, negate the autophagy on a fast? Im wondering the same question, I drink 3 cups of thin coffee and a lemon diluted into three glasses, but if this retards the autophagy itd be nice to know so were not waisting our time. Get more info. There is glycogen in the liver which has to & is burned in the first several days of fasting. I am under the impression from something I read that autophagy starts after a couple weeks of fasting. I am researching to find that point of initial autophagy. this is an article that is very technical about amino acid and autophagy, maybe someone smarter than me can tell if Glutamic Acid (bone broth) is included in the amino acids that stop autophagy? I’m on day 5 of a planned 28 day fast. I’m including both lemon and cucumber infused water and mineral water, as well as coffee and tea. I’m considering adding bone broth on my last week. It would be great if someone could say more definitively if bone broth stopped autophagy or not. Thank you. also please tell me if a long term fast is detrimental to your metabolism. Is doing several shorter term fasts better for metabolism? sorry to be a pest, it just seems that this is the only place to find answers. Maybe intake of fat does not negate autophagy in the way intake of proteins or carbohydrates do. Considering that fats give very little insulin response, and it is the anabolic effect of insulin that promotes protein synthesis (often used by body builders for that reason) and inhibits proteolysis. Could it be simply the lowered insulin levels that allow for protein breakdown? Of course, little response is still different from no response, but a little heavy cream or bone broth is not likely to be too disruptive. Although, the science he has shared so far only implicates carbs and protein… I need to hunt for more evidence. Heavy cream and coconut oil are fine. Fat does not stop autophagy. Cream has enough carbs and protein in it to stop autophagy. Do a search for “fasting mimicking diet”. I am a 3 day per month (most months) water only faster myself but found the research to be interesting. It seems mostly that the protein restriction is the magic although their diet was only 40-50% of normal calories. Could this also explain the link between insulin use or hyperinsulinemia and cancer? You should do a blog post about data on insulin as a growth factor. I have been doing IF for 1,193 straight days. Eating every 16 to 20 hours but mostly 18. I also exercise heavily. I’m 67 & have never felt better. Also have been on a Paleo diet for 6 years. How are you doing now sir? Just goes to show that age is just a number. You are such inspiration! I am a 63 year old with metabolic syndrome who had a severe neuromuscular reaction to a statin drug in 2016 that (almost killed me and) virtually immobilized me for a year+ with profound weakness, fatigue and nightmarish (8/10-10/10) pain in all muscles that supported moving joints. Trying to recover my health from that catastrophe and save my life. Started LCHF in Feb 2018 and just began OMAD after reading about autophagy and apoptosis. The science has given me hope and your example has reinforced it. I am grateful to hear your story of success. Sorry Robin, that’s terrible. Consider taking omega 3 fatty acids. Unless you eat a lot of fatty fish or do serious supplementation, you are low in this ESSENTIAL nutrient, like most seniors. I’m diabetic and recently learned of the benefits of supplementing it. As a diabetic I need to take 7,000 mg a day. By the way I’m 64. Very good sir! I’m 63 and been doing IF/EF/KETO since December 19, lost 50 lbs already and feel great!! Fantastic! I just turned 64 and am working on my diabetes to reverse it. Wish someone had answered your Q, Mary, as I am also facing a surgical procedure and was wondering the same thing. Did your surgeon give you any feedback on this? I am a hindu brahmin observing full fast for a day once in 15 days , that day is called as Ekadhashi . Next day early moring we break the fast & take light food after doing puja . So with this autophagy will work out better . I find it fascinating that some people fast because there was transmission of innate wisdom from their traditional background. Bless you in that! I wonder, with all the new science about fasting, would you ever try a longer fast. Does caste system still exist in India? Dr. Jason Fung’s new book, THE COMPLETE GUIDE TO FASTING, answers all these questions. It works. I also take Serrapeptase and Nattokinase while fasting. I usually go for 5 days and eat moderate protein and lots of fat on 6th day and then repeat 5 day fast. I have been doing 22:2 fasting for the last 5 days and have noticed an amazing increase in my energy levels. I was diagnosed with ME about a year ago and have really been struggling to do more that 30 mins activity before I needed a rest. Today I was active from 9 am till 3 pm without a break!!! I’m really hoping this isn’t just a fluke.. can someone tell me what’s going on?